In gardening, a perennial plant is a winter hardy herbaceous plant; that is a plant which dies down to soil level at the end of the growing season and grows back in the next. The term perennial plant is further restricted to those plants which bloom over several years. A biennial, or at least a true biennial, only blooms once, namely in it’s second year. In terms of gardening history, the extensive use of perennials in gardens is a relatively recent phenomenon. The large private and public gardens of High Victorian England emphasized annuals. These tender plants were raised in heated greenhouses over winter and were then planted out in formally structured beds of massed colour when spring came. The gardener- journalist/writer William Robinson came to reject this formal and costly style of gardening, which in the large gardens of the elite, required a team of gardeners who worked under a head gardener. In his book ‘The Wild Garden’ (1870), Robinson promoted a very different type of garden, which included the use of hardy native plants and also hardy plants from other temperate regions . So what is perennial gardening? The most appreciated of all plant qualities is colour. 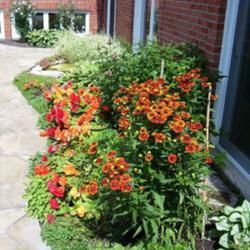 With a perennial bed, flower colour that changes throughout the growing season is possible. The huge variety of perennial plants which exists also provides huge variation in plant form and leaf texture. Thus perennial gardens can display very varied plant forms and leaf textures as well as colours. 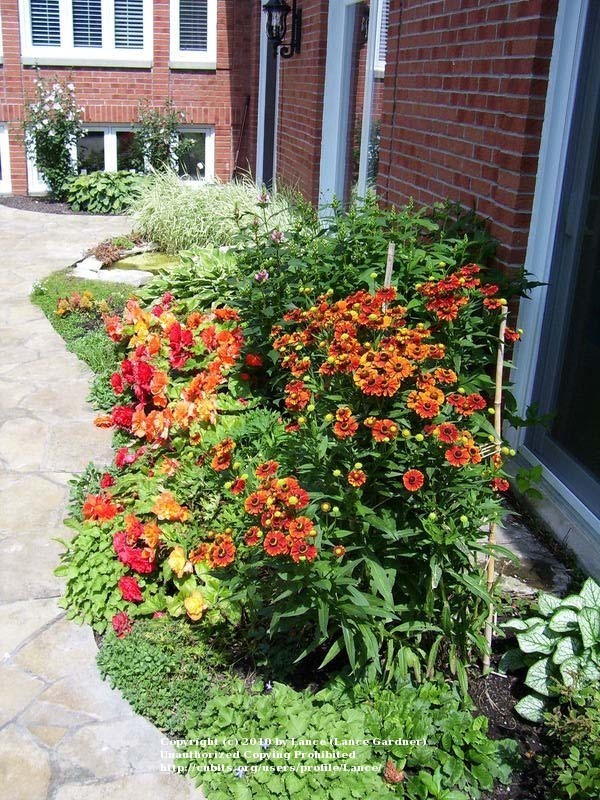 Frequently gardeners use a small number of hardy, easily maintained and long-lived perennials in flower beds, along with annuals and/or shrubs (as seen in the photo to the left). Smaller gardens lend themselves to this approach. Connoisseurs of particular perennials may emphasize one type of perennial in their plantings, e.g. daylilies or a type of iris. 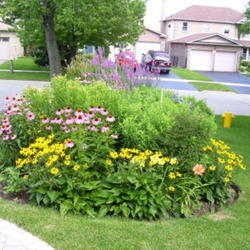 In shade perennial gardens, the plants tend to bloom in the spring and so flower colour is not significant after that. 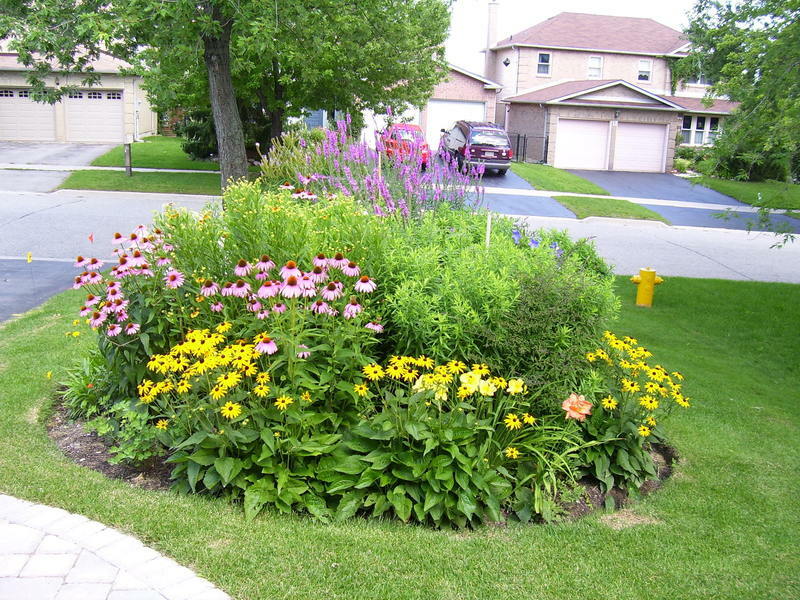 Perhaps the extreme in perennial gardening is the mixed perennial bed which contains only perennials and in which the plants are used so flower colours change through the spring, summer and fall, as shown to the right. Perhaps this should be called ‘Extreme Perennial Gardening’, since it is so challenging. A huge number of perennial plants of horticultural value do exist, but the bloom time of most is quite short, often as short as two or three weeks. Consequently, this type of perennial gardening requires the use of large and deep (wide) flower beds, containing large numbers of different perennial plants. Ideally, the depth of the bed should be great enough for a person who looks into it to always see colour in front of them, whatever the season and wherever they’re standing. It is not easy to maintain such a bed through the seasons, but continuing to do so from year to year is even more difficult. As true gardeners know, gardening is a hands-on learning activity. Perennials come in a far greater variety of types than annuals and using large numbers of different perennials means learning to deal with a great variety of plant needs. Using a few choice perennials is one thing, but be assured, with Extreme Perennial Gardening, the challenge never ends!